Review: Colette / It's Just Movies Review: "Colette"
Sidonie-Gabrielle Colette was once a charming, happy farm girl in the farmlands of France in the late 1800s. She is seduced by Willy, an older, dapper Parisian author and publisher. They set up married life in Paris where she learns that her new husband is a philanderer, gambler and compulsive liar. To keep them financially afloat, he asks her to write a book and it ends up becoming a best-seller. This biopic, set at the turn of the 20th century, focuses on Gabriel’s process of emancipation. 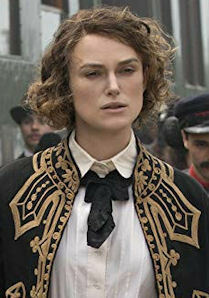 Starring Keira Knightley as Gabriel, “Colette” is the title character of Gabriel’s books, which are actually based on her own life. Her narcissistic husband, with her acquiescence, has them all published under his name as the author. The Colette series ends up having the most popular book character in France and earns them a flood of money. The problem is that Willy’s gambling, womanizing and high living continually puts them into bankruptcy. At one point, he locks her in a room so that she will write yet another book to get them out of debt. As Gabriel evolves into her own self-willed character, Willy represents the oppression and dominance she must overcome to obtain her own self-actualization. The acting is strong and the cinematography evokes the historic beauty of French life. But Gabrielle is neither Mother Theresa nor Eleanor Roosevelt. Her route to self-discovery can make the viewer uncomfortable with its focus on self-indulgence and sexual exploration. There is no redeeming growth. Perhaps it’s the screenplay, the acting, the directing or the subject choice of Gabriel, but the biggest problem with “Colette” is that I wasn’t compelled to care either about the characters or the story.